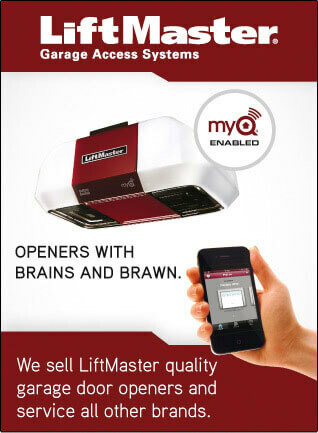 Your new investment deserves a flawless installation and highly qualified service. For this reason, Car‑Wal Garage Doors is dedicated to working with you every step of the way, making your experience an enjoyable one, from choosing the right door to the final flawless installation. Quality work time after time: that’s the promise made to all of our customers. For consumers who don't require the utmost in energy efficiency but nonetheless need an insulated door, the Acadia 138 is ideal. This door is an attractive compromise between getting an economically priced door and a respectable insulation factor. Its beauty and durability team with Garaga quality to give you an attractive, high-quality door, all while respecting your budget. With a galvanised steel surface and insulating polyurethane, the Standard+ garage door meets every need of a homeowner seeking durability and ruggedness. 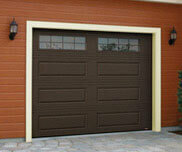 With its wide variety of colors and patterns, this door suits every type of home. 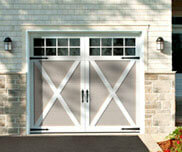 The Standar+ North Hatley LP is a stunning blend of charm and traditional elegance reminiscent of carriage-house doors. With its vast array of wrought iron hardware and decorative windows, the Standar+ North Hatley LP will add value and prestige to your home. With a nod to history, the Eastman E‑21 door reminds us of traditional carriage house doors but retains all the attributes of high tech Garaga doors: superior energy efficiency, extremely low maintenance and unmatched durability. 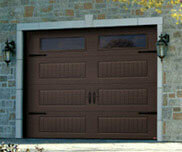 Purchasing a Garaga door means choosing first-rate quality without compromise. Expertly engineered to withstand the harshest climates, Garaga pays attention to the smallest details from design, colors and decorative extras, to high-quality construction and performance. Whatever your budget reality, we have the right door to enhance the look of your home and meet your specific needs. It's no wonder Garaga doors are the undisputed market leader! And with the Garaga Experts Network, you're sure to benefit from the services of the very best garage door professionals in the industry, right down to the smallest detail. Each Garaga Expert is committed to delivering total customer satisfaction. From helping you select the door best suited to your needs and home style to the final installation, your Garaga Expert is there for you every step of the way. Your Garaga Expert can also help you implement a maintenance and follow-up plan to ensure that your new garage door and home's curb appeal give you a sense of pride for years to come. Let us be your guide! Thank you for submitting your request. 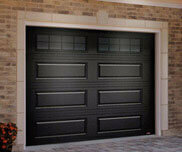 Car‑Wal Garage Doors will be contacting you shortly.